When classic plaid flannel meets elegant velvet the results are simply astounding. 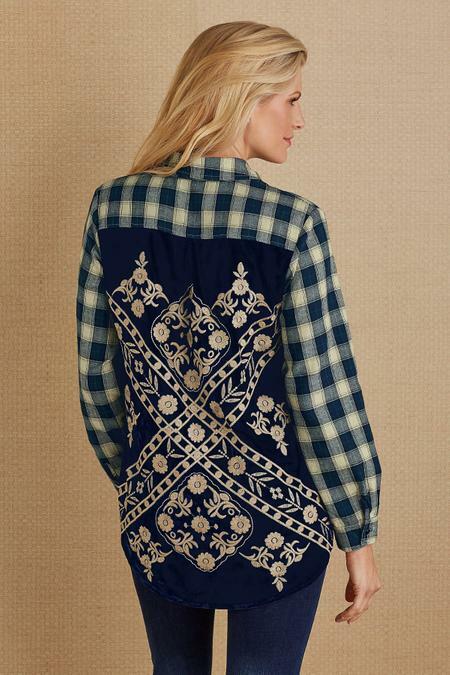 Designed with a button closure, long button-cuff sleeves and a shirttail hem, our soft flannel shirt is traditionally styled - until you turn around and discover the rich navy velvet back, elaborately embroidered with floral medallions and motifs. Uniquely stunning - and surprising. Cotton; poly/span. 29"/31" long.